Jean-Paul Sartre | Vorwärts und nicht vergessen! Jean-Paul Sartre was born June 21, 1905 in Paris, an only child and the great-nephew of Albert Schweitzer. He and his lifelong companion Simone de Beauvoir met at the Ecole Normale Superieure, where he graduated in 1929. After teaching and traveling for several years, Sartre headed a clique of West Bank intellectuals. His first novel, La Nausee, came out in 1938, followed by the fictional Le Mur (1939), then a collection of short stories, and some plays. Drafted during World War II, Sartre was imprisoned for a year in Germany, and either escaped or was released, returning to work in the Resistance. Following the war he founded the magazine, Le Temps Modernes. Being and Nothingness was his existential masterpiece (1943). Sartre’s nonfiction also included Existentialism and Humanism (1946) and What Is Literature (1947). Sartre was twice the target of terrorist attacks by opponents of Algerian independence, who exploded bombs in his apartment in the early 1960s. Sartre headed the International War Crimes Tribunal set up by Bertrand Russell to judge American conduct in Indochina. His last work was an unfinished biography of Gustave Flaubert. 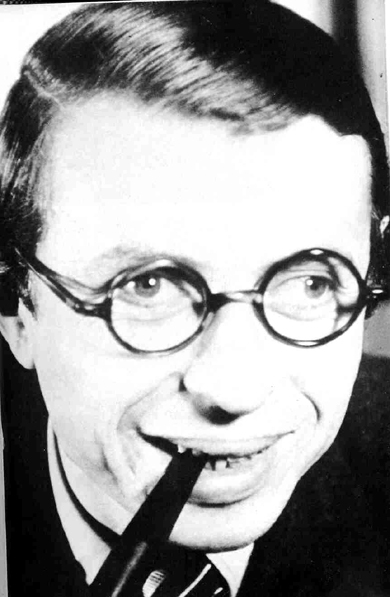 Atheism was an essential ingredient in Sartre’s existentialism: „Illusion has been smashed to bits; martyrdom, salvation and immortality are falling to pieces; the edifice is going to rack and ruin; I collared the Holy Ghost in the basement and threw him out. . .“ (The Words, 1964). D. 1980.